True Vape were introduced to Pedleyonline following a recommendation from one of our existing customers. 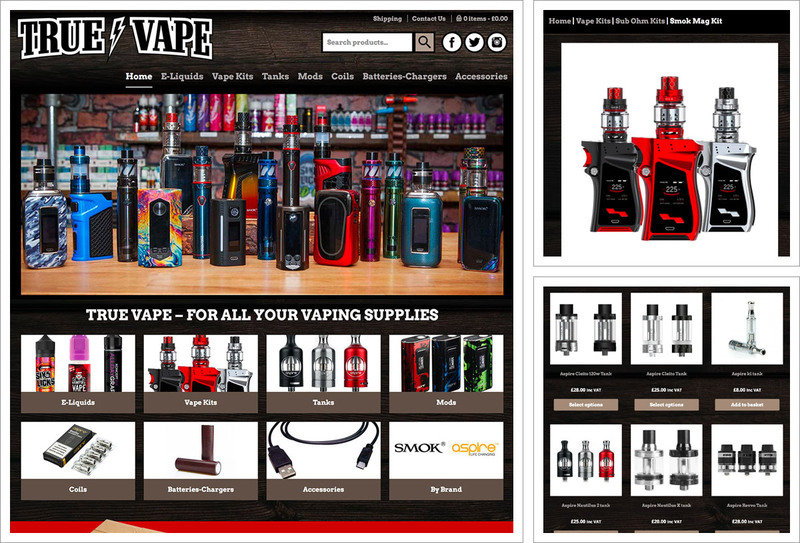 True Vape realised the importance of establishing a web presence and spoke to us about making an initial start with a single holding page linking to their Facebook page and incorporating their existing branding. Soon after launch, True Vape made the decision to go eCommerce. We discussed the functionality required which included categorising products, products with variations such as size and flavour, 3 for 2 offers, variable shipping rates. There was also a requirement for a age verification pop-up due to the sale of nicotine products. WooCommerce is used to deliver eCommerce functionality to WordPress websites and delivers much of the common shop functionality required, such as the ability to create products, categorise them, add to basket, check-out and invoice creation. The website is hosted by Pedleyonline with an SSL certificate for added security.